Muslims in Malaysia and all over the world are celebrating Hari Raya Aidilfitri today. Also known as Hari Raya Puasa, this is a religious holiday where Muslims conclude the Ramadan holy month of fasting. 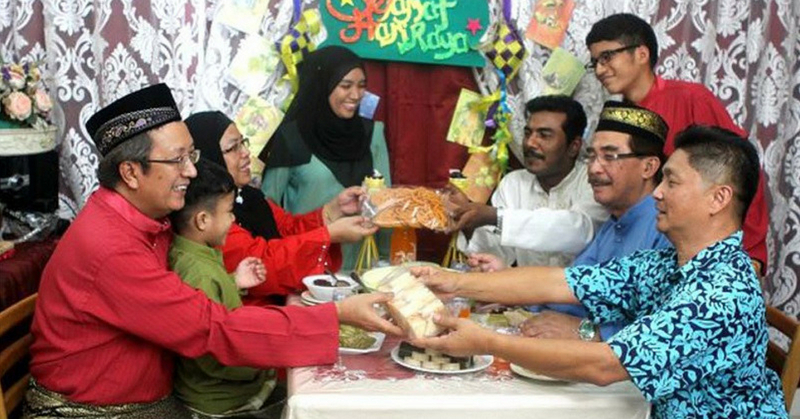 In conjunction of the festival, here’s how Hari Raya is typically celebrated here in Malaysia. In the morning of Hari Raya, Muslims will wake up early to visit and perform prayers at the mosque. To them, this is an important day to express their gratitude toward God for the blessings that they have received throughout their lives. Children will seek for forgiveness from their parents and in return, they will be gifted with a green packets containing money, or also known as “duit raya”, which are among the highlights during the festivities especially among kids. This is also a time where family members gather together to catch up over a feast of home-cooked meal. Open house is common throughout the month because it’s a great opportunity for them to invite their friends and neighbors of different races to celebrate this festival together. Throughout Hari Raya, Muslim will put forth their best outfit to welcome the festival. Typically for men, they’ll usually opt for the male version of Baju Kurung together with Kain Samping- a piece of cloth that worn over the trouser of Baju Kurung. They will also wear a songkok on their head to complete the look. For the ladies, usually they will wear a Baju Kurung, Baju Kebaya or Jubah. Of course, with rapid modernization, there are more fashion options these days so this is where things got a little more interesting. During Raya, people will gather around and share conversation and laughter over a variety of cookies, candies, and traditional delicacies. One of the favourite traditional snacks that Muslims really love to have is non other than ketupat. Ketupat, which is a a rice cake is one of the prominent symbol for Hari Raya. Ketupat is made with handwoven palm leaf strips where rice will be stuffed to the brim to form a diamond shape. Once it’s cooked, you can peel it and cut it into cuts to serve with other dishes. Lemang is another another glutinous rice dish that people usually eat during Raya. It’s made from glutinous rice, coconut milk, and a sprinkle of salt. Lemang is normally served with rendang or curry dishes, making it the perfect substitute for rice. Lemang takes about 4-5 hours of roasting in a hollowed bamboo stick lined with banana leaves before it is ready to be served to guests. Other famous customary Raya dishes which you can usually expect during a Raya open house are Satay, Masak Lemak, Asam Pedas, Sayur Lodeh, Lontong, kuih-muih and more! 4. How does Muslims greet? “Selamat Hari Raya” is one of the most common and traditional greetings used by Malay Muslims. “Selamat” also means happy. “Maaf Zahir dan Batin”, on the other hand, is another greeting, which means “I seek forgiveness from you”. Another term which is commonly used is “Eid Mubarak” which has an Arabic origin that means “Happy Hari Raya”. From 1996 to 1998, Hari Raya Puasa and Chinese New Year actually fell on the same week! So two different festivals were celebrated together, which inevitably prompted the term “Gongsi Raya” or “Kongsi Raya”. These terms were originated from Malaysia and it eventually got accepted by Singaporeans to commemorate and to recognize the two celebrations. Sevenpie would like to take this opportunity to wish our Muslim friends Eid Mubarak!